Frankfurt (am Main) is a little over an hour from Stuttgart by train, which makes it an excellent location to visit for a day or for the weekend. We've been twice now to check out the city, and while it certainly has a more metropolitan feel than Stuttgart, we very much appreciate the historic charm of the old city and more international character of the food. The first time we visited for a day trip on our own. The city is very walkable, and we enjoyed exploring and discovering new restaurants and shops. On our second trip this past weekend, we went with the intention of visiting our very good friends who recently moved to Oberursel, just 20 minutes by S-bahn north of the inner city. We later found out from a local that this arrangement is actually quite common. Some three million people work in Frankfurt during the day, while just 700,000 actually reside within the city limits at night. 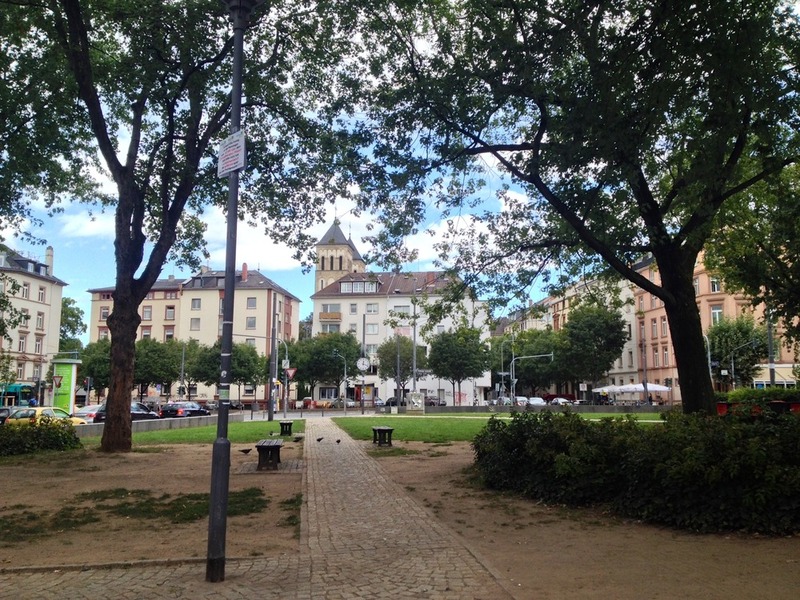 It is a hub of activity and somewhat expensive in terms of housing, which helps to explain our friends' decision to locate their family slightly outside of Frankfurt proper. 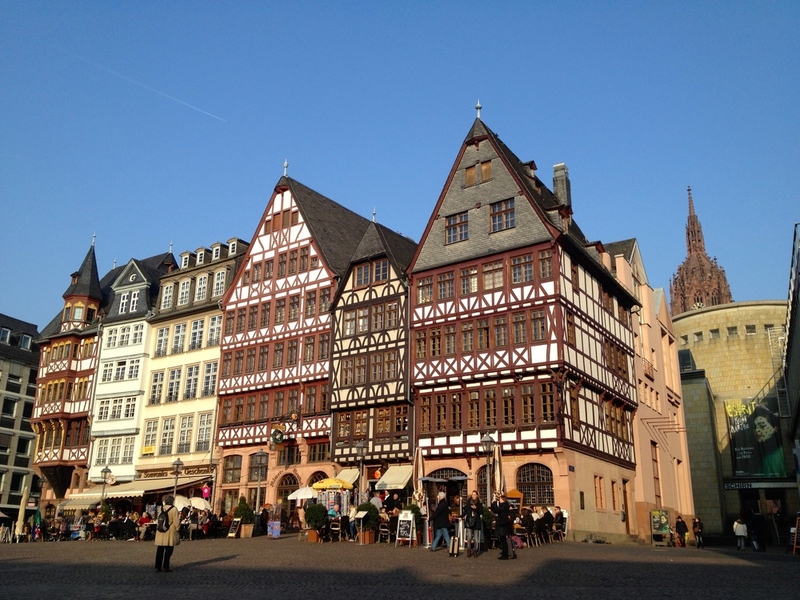 As part of our visit, we decided it would be a fun idea to take a food tour of Frankfurt. I've come to really love food tours after our experiences in Prague and Amsterdam, and so we thought a Frankfurt tour would give our friends and us a chance to get to know the city a bit better. Eat the World offers several food tours in major cities throughout Germany both in German and in English. The tour available to us was the Nordend (North End) tour. We met our tour guide Karen at Friedbergerplatz on the corner of Günthersburgallee. She was very personable and funny as she told us stories about the neighborhood and her life in Frankfurt. If you take the same tour, I highly recommend her as a guide. From there, we first walked to Backerei Kronberger on Vogelsbergerstraße where we sampled a delicious Sicilian lemon cake, which our guide told us is still made with hand-squeezed lemons. 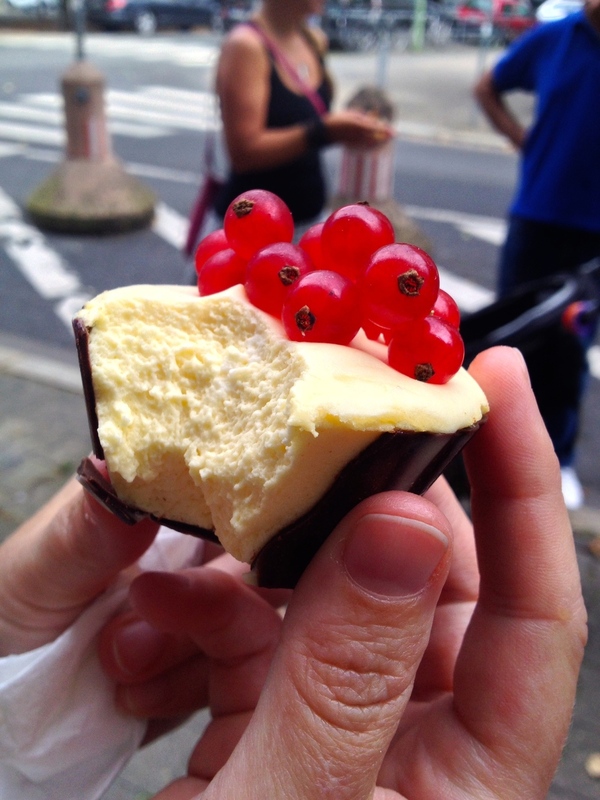 We also got to try another pastry, which tasted like a grapefruit mousse in a chocolate cup topped with red currants. It was light, not too sweet, and very summery. Our next stop was Nordlicht, a little restaurant that specializes in international cuisine and rotating daily specials based on fresh ingredients. 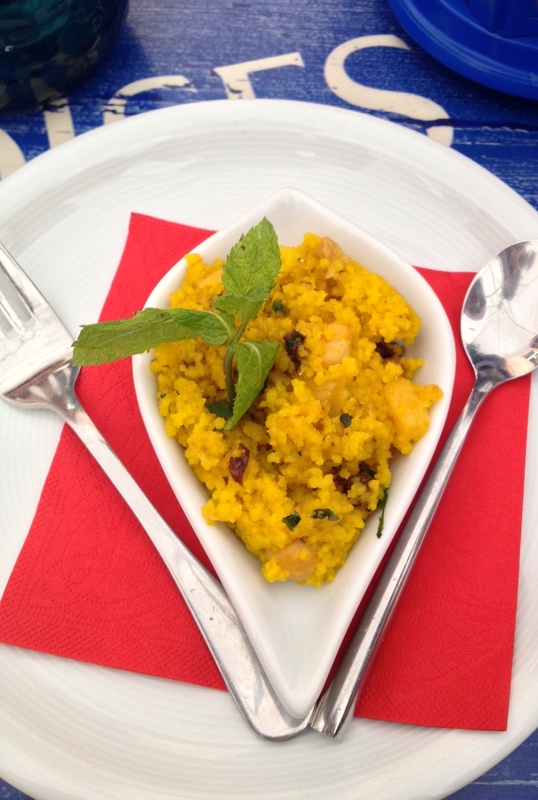 We got to sample a fluffy couscous that was still warm and studded with raisins and chickpeas and just a hint of spice. After that we moved on to Olive on Bornheimer Landstraße, which is a fine food shop specializing in Italian products. We tasted some delicious homemade Italian sausages, including a spicy sausage, as well as a couple different types of cheeses, one soft and one pecorino, and some excellent black olives. Tip: Make sure you carry cash with you in Frankfurt. Most of the restaurants that we visited accepted cash-only, so if you wanted to buy anything extra or take something to go, then you needed paper currency. Our next two stops were super fun: Wir essen Blumen and Suppengrün. 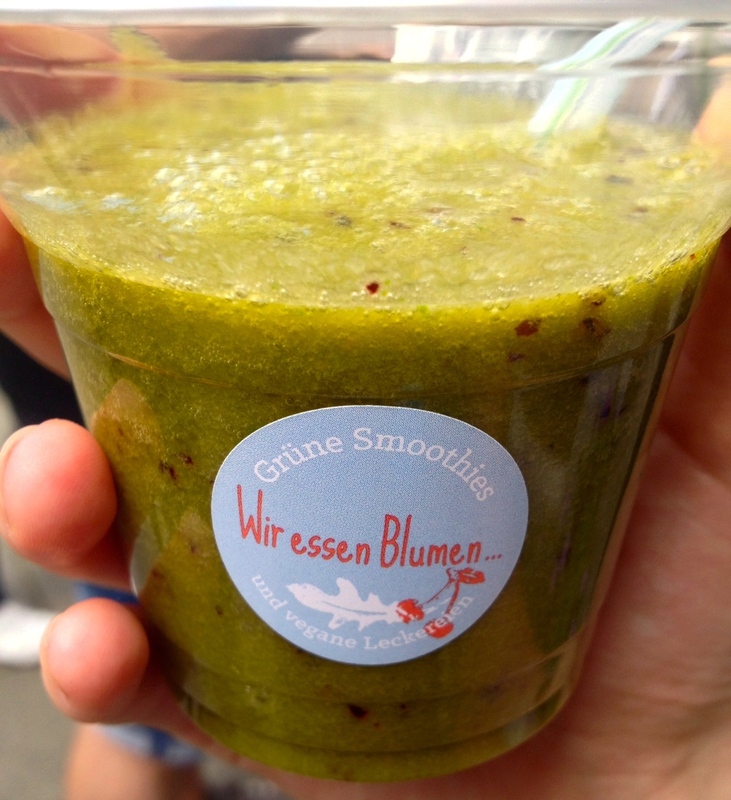 At Wir essen Blumen we got to try a delicious green smoothie by health-conscious (and one vegan) partners. 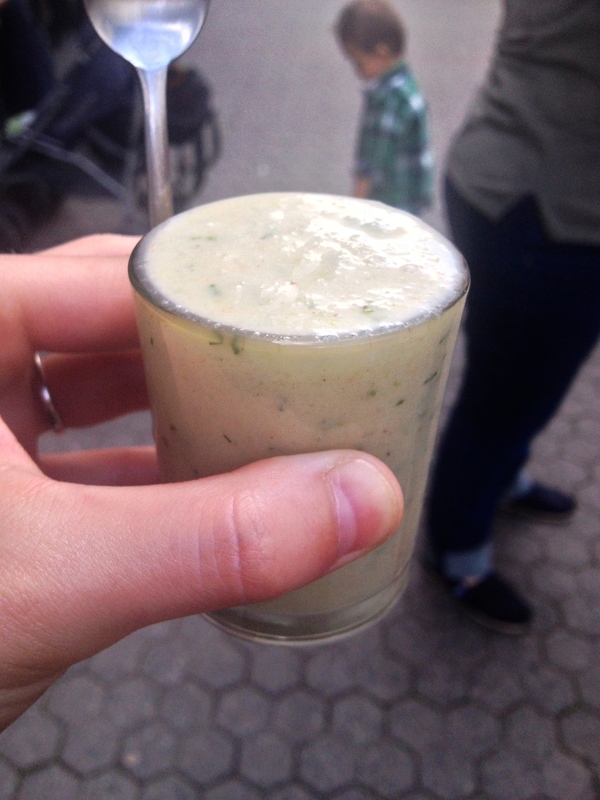 Apart from store-bought green smoothies, I'd never had a fresh one before, and I was surprised by how smooth and a little sweet mine was. At Suppengrün we enjoyed some delicious homemade soups using vegetables from the Bio vegetable shop next door. I tried a chilled, creamy cucumber soup with dill that tasted very fresh. They also offered a tasty curry soup and a lemon-fennel soup on that day. After our healthy tastings, we needed a little sugar to get us back on track, so we stopped at Schweiger's Mint, a local ice cream shop run by an Argentinean-German couple with a master's degree in ice cream from Bologna. I tried the dulce de leche on recommendation from our guide. It was like eating smooth, creamy caramel straight from the jar. My friend, however, swears she won the pick award with her ridiculously fresh lemon-lime-mint ice cream, which we agreed would have made a superb mixed drink. And finally, our last stop of the tour was Wiesenlust where we enjoyed some home-cut fries and sweet potato fries. The big draw here, however, were the sauces: orange-curry, ginger, chili-curry, BBQ, and homemade ketchup. Our hands-down favorite was the smokey BBQ sauce, which our guide was nice enough to convince the restaurant staff to sell us a small jar of. Their burgers looked pretty delicious, as well. Tip: Stop by Caffè Leidenschaft for a coffee and slice of cake in the afternoon. It's not on the tour, but it is right across from the last stop at Wiesenlust. Our guide recommended this tiny place to us, and we really enjoyed the espresso and blueberry cake that we tried there. I have to admit that the tour was a little different from the ones we went on in Amsterdam and Prague. 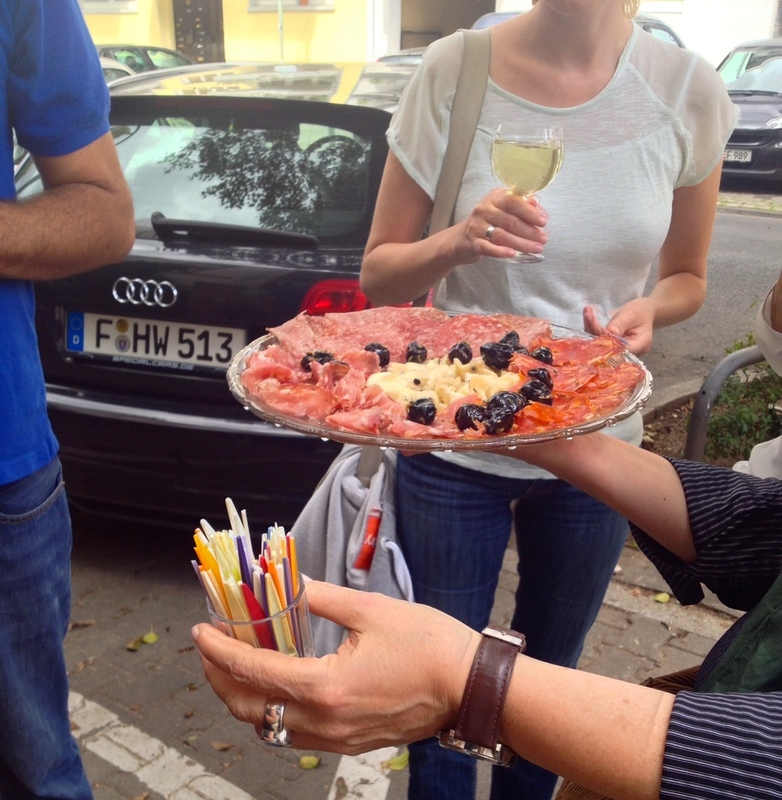 On those tours the focus was more on experiencing the Dutch and Czech cultures through food. On this Eat the World tour, the focus was more on experiencing local, fresh eateries off the tourist track. Many of the restaurants we stopped at were organic, and were known for the quality of their ingredients and cooking. I also wasn't as stuffed on this tour as on our other two tours, which I think is reflected in the slightly more manageable 30€ price tag (and which is still a great deal for three hours of food and entertainment). While I can't say I liked one kind of tour over the other, I did appreciate how our Nordend tour really helped me get to know one area of Frankfurt a bit better. Tip: If you're spending a few days in Frankfurt, go on the Nordend tour on your first day in the city, if possible. I find that culinary tours are great because then you can pick up some great recommendations for dining either from the places visited on the trip itself or from the tour guide, so that you're guaranteed delicious meals throughout the rest of your stay in the city. Also, don't forget to pack a bottle of water with you for the tour as drinks are not always included with the food. If you have some more time in Frankfurt and want to see a bit more of the city, then I suggest you take the subway to the Altstadt and walk around a bit. You can see some beautiful churches, like the Frankfurt Cathedral (Dom), and historical German architecture, like the Römerberg, as you wander around. You should also take a stroll across the river to the old quarter of Sachsenhausen with its cobblestone streets and half-timbered houses. Go there to try some of the city's famous Apfelwein (apple wine), though be warned that for some it's an acquired taste. Iimori Pâtisserie -- I love this Japanese bakery in the heart of Frankfurt, because they make the best melonpan that I've eaten outside of Japan. They also have some pretty delicious green-teapan, anpan, and currypan, in addition to other Japanese and French pastries like macarons, cinnamon rolls, croissants, and breads. They also have a small restaurant attached to the bakery that serves sushi and other Japanese dishes during lunch and dinner. A word of advice: If you go just for the melonpan, then go earlier in the day rather than later so you can be sure that they don't sell out. Tip: Frankfurt is also the closest city in the area with my favorite Japanese home goods store: Muji! I like to shop here mostly for the awesome pens and stationery, although they sell some great clothing and other functional bits and baubles for your house. They're located on Kaiserstraße 12, just a few blocks from Iimori bakery or a 10-minute walk from the Hauptbahnhof towards the old city center. Bitter & Zart Chocolaterie -- Just down the street from Iimori is this gorgeous chocolate shop. Every time I walk in the store, I feel like I'm in either Willy Wonka's chocolate factory with the scent of cocoa that hits your nose as you walk in or in some kind of Belle Epoque shop with the tables and walls lines with silver trays, crystal dishes, and glass jars all with chocolates and candies. I like their selection of chocolate bars and marzipan confections, but Matt prefers the homemade white mice. Whatever your sweet tooth is craving, I'm sure you can find it here. Stern-Kaffee am Paulsplatz -- This coffee shop was just opening when we visited back in March. If you need to recharge while you're out, then I recommend you avoid Starbucks in favor of this family-owned, locally roasted coffee. I'm not a coffee connoisseur, but I know enough to appreciate a fine cup of brewed coffee, and I promise you Stern's coffee tastes better than any drip coffee or espresso that you could get at Starbucks. Kleinmarkthalle -- One of my favorite places in any European city are the markets and market halls. I love seeing the variety of foods on sale and tasting what's fresh. Stop by Metzgerei Schreiber to try one of their fresh-cooked sausages, like the giant gelbwurst. Just be prepared to wait a bit as they are quite popular at lunch time, often with the line winding almost to the entrance. Have you been to Frankfurt? What are your favorite food spots in the city? Leave your recommendations in the comments below. I'm always looking for new places and foods to try.